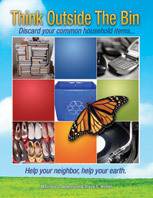 To wrap up Get Organized Month, we’re giving all new subscribers to this blog a FREE copy of our handy, dandy, 152-page interactive resource guide, Think Outside The Bin: Discard your common household items… Help your neighbor, help your earth. You may share this link with friends but the free book is only available until January 31, 2011! So, hurry and subscribe! Think Outside The Bin is a directory of website links to people and organizations that collect things like shoes, cell phones, electronics, backpacks, costumes, trophies, movies, musical instruments… over 154 items! You’ll find creative ways to recycle, donate or sell the common everyday-items busy families have to discard. This guide gives you the opportunity to reach out and be a part of something so much more important than recycling. We call it “Social Recycling”. You want to do the RESPONSIBLE thing with your stuff and help your neighbor, help your earth. If one of your New Year’s Resolutions is to get organized, grab a free copy of Think Outside The Bin by becoming a subscriber (sign up is on the top right of this page). Make 2011 the year you get organized! This entry was posted in Get Organized, Social Recycling, Think Outside The Bin and tagged Ed Begley, Get Organized Month, recycling guide, social recycling, think outside the bin. Bookmark the permalink. How do we get this book for free? I have subscribed, but there is no link to download it. Does it come via email? I am looking forward to reading it! Thank you! Copies of Think Outside The Bin will be emailed to subscribers today! Pingback: Earth Day April 22, 2011 Ways To Recycle and Help Charities and Great Causes! Ed Begley Would Love This! | Taking On A Cause by Patsy McCaw-Yager,Englewood, Fl. Thanks I have linked your very important information to my blog today! Pingback: Earth Day April 22, 2011. More Ways to Recycle -Ed Begley Fans This Is For You! | Taking On A Cause by Patsy McCaw-Yager,Englewood, Fl.